Do you have to walk from the bus stop to your work, come rain or shine? Then we’ve got the solution for you! 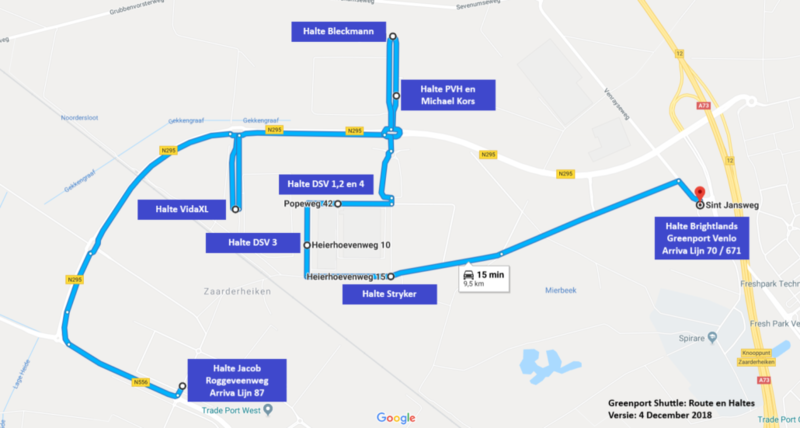 As an employee of Michael Kors, PVH Logistics, Bleckmann, DSV Solutions, VidaXL or Stryker ESCS, you’ll be able to use the shuttle bus at Greenport Venlo starting from 10 December 2018. This will take you from the Arriva bus stops at Greenport to your company’s front door, for free. At the end of the working day, you’ll be brought back to the bus stop. It’s that easy! What is the timetable for the shuttle bus? The shuttle buses run on Monday to Friday, from 5.30 am to 10.00 am and from 3.00 pm to 8.00 pm. A shuttle bus leaves every 15 minutes. This timetable gives us the best possible connection with the times of the 70, 87 and 671 Arriva bus lines. View the shuttle bus timetable here. Do you work for Michael Kors, PVH Logistics, Bleckmann, DSV Solutions, VidaXL or Stryker ESCS? Please ask the HR department of your employer. You’ll then receive access to the web app via your company, enabling you to book your rides. Do you have a registration code for the web app? Book your rides! Why is my company doing this? By offering the shuttle bus service, your company, together with the other partners, is ensuring that you can reach your work safely and easily. That’s not only great for you, but it’s also good for the economy and the environment. And everyone benefits from that! Employees of six large Greenport Venlo companies so far can make use of the pick-up and return service. A shuttle bus takes them from the Arriva bus stops at Greenport to the company’s front door, and then back again at the end of their working day. With this initiative, the companies are collaborating with the government to make Greenport Venlo more accessible, and therefore more attractive. The shuttle service is part of a wider range of mobility solutions for Greenport. The goal is to create a mobility hub at the bus stops, with shared bikes and cars on offer alongside the shuttle bus. Bicycle infrastructure at Greenport will also be investigated. All of this is intended to provide safe and sustainable transport at Greenport Venlo and beyond. 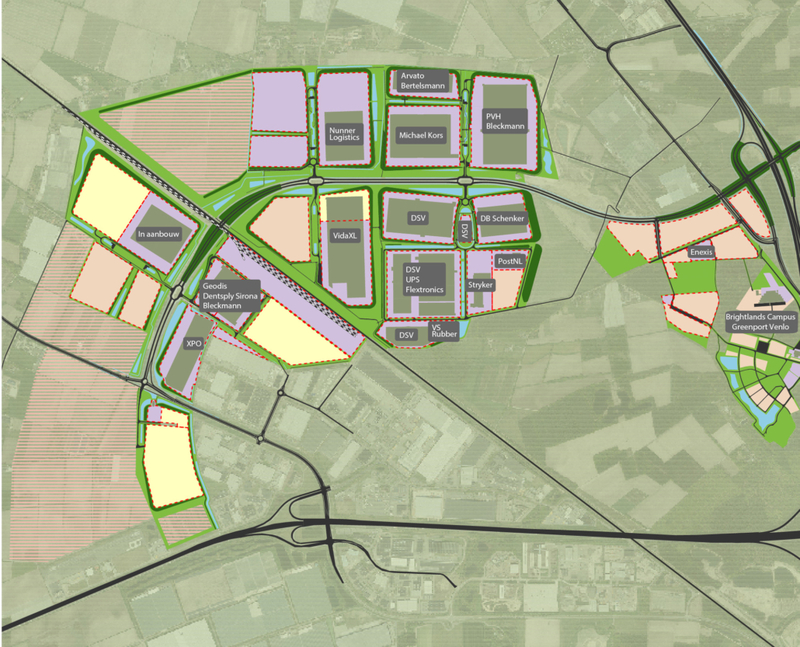 Michael Kors, PVH Logistics, Bleckmann, DSV Solutions, Stryker ESCS and VidaXL Enterprising Venlo, the municipalities of Venlo, Horst and Venray, Trendsportal, the province of Limburg, Arriva and the Greenport Venlo development company. Would your company at Greenport Venlo also like to participate in this project? Please contact Enterprising Venlo. If you have a registration code for the web app, you can go ahead and book your rides! – you’ll receive the log-in code via your employer – to find out how, see: ‘How can I register?’. In the web app, indicate the days and times you wish to travel, and from which bus stop to which company. Do the same for the return trip from the company’s premises to the bus stop. You can book for several days. After making your booking, you can view your rides. Make sure that you are at the bus stop or your company’s boarding place at the time you have specified. On boarding, show your reservation/ticket on the web app to the driver, and take a seat in the shuttle bus. Do you work for Michael Kors, PVH Logistics, Bleckmann, DSV Solutions, VidaXL or Stryker ESCS, but you don’t yet have a log-in code? Please ask the HR department of your employer. You’ll then receive access to the web app via your company, enabling you to book your rides.